If you would like to purchase this painting go to the painting product page. 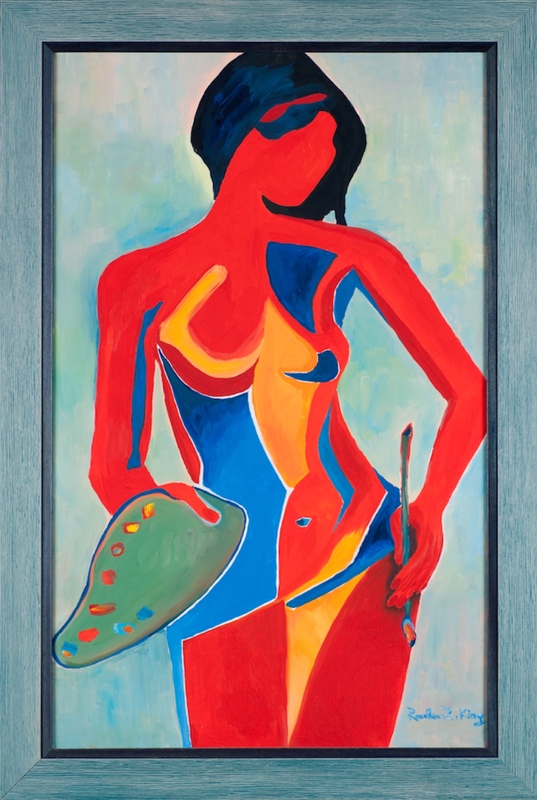 The oil painting Girl with a palette is a self-portrait of the artist. Originally sketched in color with gouache paints on paper while looking in the mirror, the artist later reproduced the original color sketch with oil on canvas. This is one of the popular pieces from the artist’s collection. The painting is framed. The frame complements the painting beautifully. This vibrant artwork brings space to life while its lines and color planes are very harmonious and have a calming effect and uplifting effect on the mind. Step 1 – Creating a grid over a black and white photocopy of a print of my old sketch and transposing the outlines on the canvas grid. Step 2 – Painting on canvas with oil paints, starting with red and yellow.